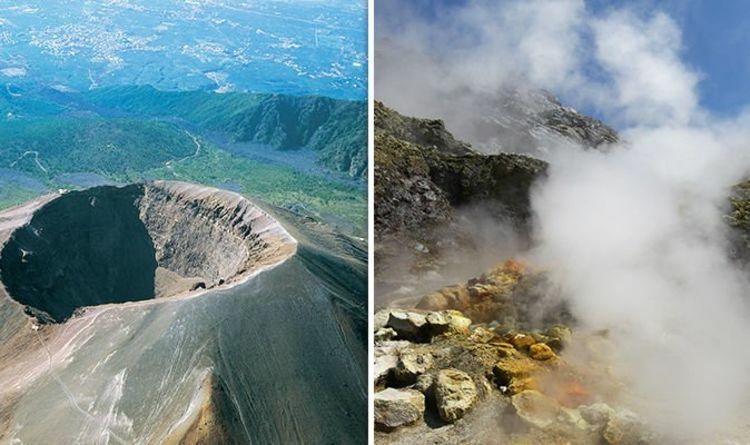 The volcano, which is located in the highly-populated Italian city of Naples, could at some point in the “foreseeable future” have a Vesuvian-style eruption, warned Dr Christopher Kilburn, a professor at University College London and expert in volcanic hazard. Speaking to Express.co.uk, Dr Kilburn explained how Campi Flegrei is a caldera and was produced by a large-scale eruption. He said: “The last major collapse occurred 15,500 years ago. Since then there have been lots of small eruptions within the caldera which is populated by about 350,000 people. The volcanologist, who has worked closely with the Vesuvius Observatory in Naples to analyse the volcano, explained how the last historic eruption was in 1538. Dr Kilburn warned the Campi Flegrei volcano is “active and will erupt again” at some point in the future. He added: “The point is that because it is the first time in nearly 400 years that the volcano has been showing this type of unrest, there is now concern that the volcano might be getting ready for another eruption in the foreseeable future. “But that type of eruption is of the size of possibly a Vesuvian-style or even much smaller. The region surrounding Campi Flegrei was the scene of two huge eruptions - the Campanian Ignimbrite (CI) eruption of 39,000 years ago and the Neapolitan Yellow Tuff (NYT) eruption which happened 15,000 years ago - plus many smaller events. The most recent was the eruption of Monte Nuovo in 1538. Campi Flegrei is located around 11 miles (18 kilometres) west of Naples, which is home to around a million people. Mount Vesuvius is around 13 miles (22 km) to the east of the city. Unlike many volcanoes, Campi Flegrei is mainly flat and is accessible on foot. Some 360,000 people live across Campi Flegrei’s caldera which covers more than 38 square miles (100 sq km) and is the closest historically-active volcano to London. If it were to erupt, it could disrupt air traffic across Europe.